Megan Boyle is a native of Tucson, Arizona. She began piano studies at age 4 and cello at age 8 with Mary Beth Tyndall. Prior to college, she participated in numerous orchestras and festivals for both piano and cello in Arizona and across the United States including Interlochen Arts Camp, Indiana University String Academy, and Chamber Music on the Mountains. She received a Bachelor’s degree in cello performance from Brigham Young University where she studied with Gayle Smith and Julie Bevan. Her other principal teachers include Gordon Epperson and later Hans Jorgen-Jensen at the Meadowmount School of Music. Megan has performed as a soloist with the BYU Chamber Orchestra and has performed in master classes for Jeffrey Solow, Emilio Colon and Peter Rejto. Megan was formerly cello faculty at Snow College and BYU. Megan has been teaching cello full-time for 15 years. She is a registered Suzuki Teacher and has completed teacher training through Suzuki Book 10. She has also completed the Suzuki Principles in Action course as well as the Practicum course. Her teacher trainers include David Evenchick, Carey Cheney, Catherine Walker, Carey Beth Hockett, Joanne Melvin and Pat D'Ercole. Megan also has additional training in the Kodaly method. She maintains an active private studio of over 60 students and coaches beginning through advanced cello choirs and other chamber ensembles. Many of her former and current students have gone on to pursue degrees in music and have been awarded music scholarships to universities, camps and other music programs. 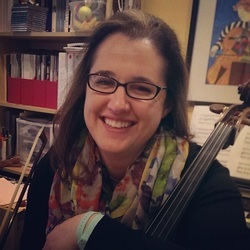 As a teacher, Megan is known for her enthusiasm and infectious love of the cello, patience in working with many learning styles and personalities, and an emphasis on technique, tone and musicality even with young students. She has extensive experience working with students with special needs, including students on the Autism spectrum, hearing loss, and adaptive cello players (players with limb differences). Megan is an active chamber musician currently performs and records with a harp, violin and cello trio. She has collaborated in coaching an annual summer piano trio workshop with her piano trio and also coaches an annual advanced cello choir workshop for high school students each winter. During her years in Utah, Megan was active in the Utah Valley music community and has served as the Chairman of the Utah Valley String Festival and as Managing Director of the Utah Valley Cello Society. Megan has been a guest clinician and guest lecturer at many Utah music events including U of U Cello Day, UVU Cello Fest and the SAU Parent and Teacher Convention. She has taught as cello and chamber faculty at the Intermountain Suzuki String Institute and was guest faculty at the Tucson Cello Congress in 2016. In May 2016, Megan relocated to Colorado Springs, Colorado and currently teaches there. She is a member of the Suzuki Association of Colorado and currently serves as the Chairman of the Membership Committee. She is also a member of the Pikes Peak Suzuki Music Association. Megan is also a member of the Suzuki Association of the Americas.